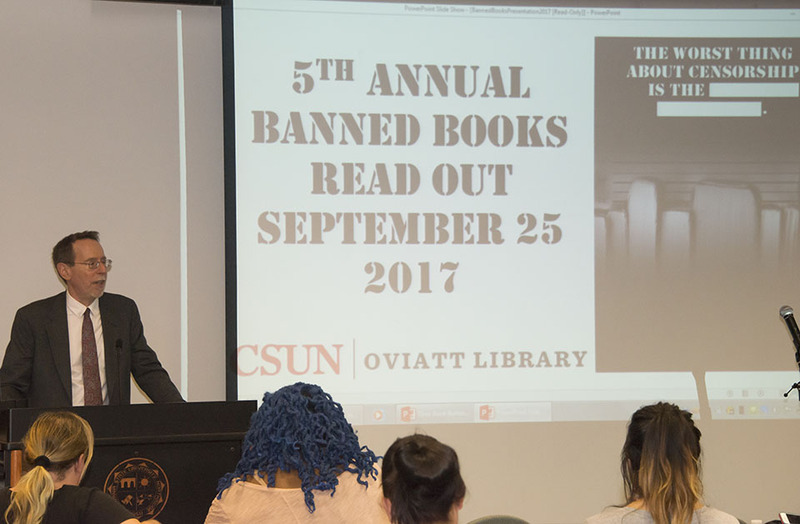 Mark Stover, dean of the Oviatt Library, welcomes the audience at the CSUN banned books readout 2017. Photo by David J. Hawkins. Author Alex Gino talks to the audience at the CSUN banned books readout. Photo by David J. Hawkins. The Delmar T. Oviatt Library and the Department of Journalism celebrate the freedom to read during the Banned Books Week 2017. Photo by David J. Hawkins. Author Alex Gino reads the first chapter of their book "George", a novel about a transgender child. Photo by David J. Hawkins. 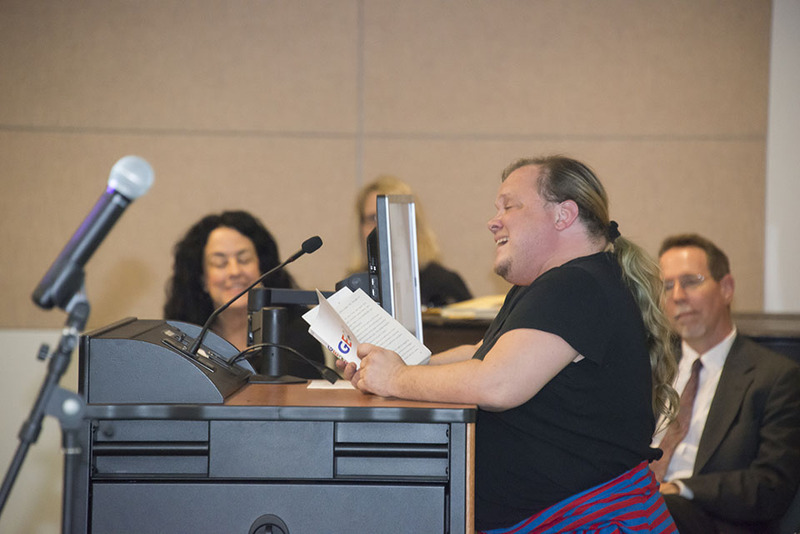 Giving voice to texts that groups throughout modern history have sought to silence was the order of the day at California State University, Northridge’s fifth annual Banned Book Readout on Sept. 25. To commemorate Banned Books Week, Sept. 24-30, CSUN students read aloud from popular books that have been censored, banned and outlawed in schools, libraries, stores and by government organizations. The event’s featured guest speaker was genderqueer author Alex Gino, whose middle-grade book George about a transgender child was one of the top 10 banned books of 2016. 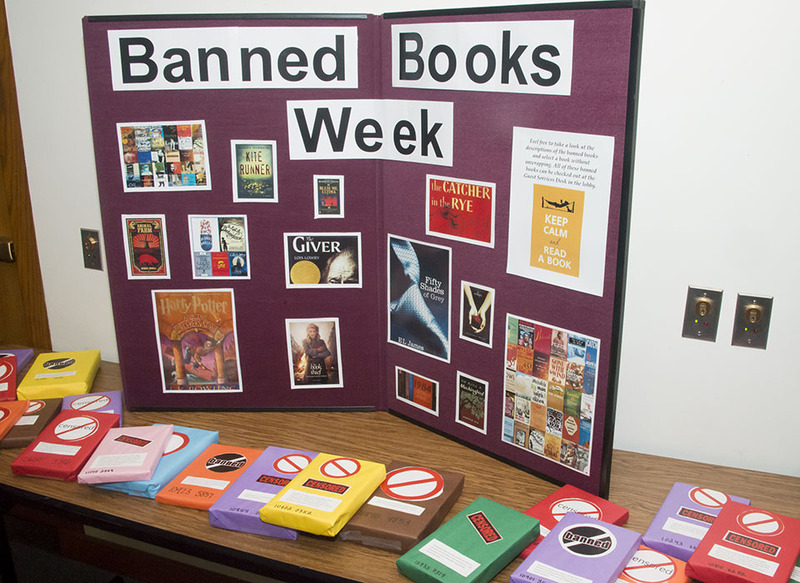 Established in 1982, Banned Books Week celebrates the freedom to read. Judith Krug, a librarian and First Amendment activist, created the nationwide event, which is promoted by the American Library Association (ALA). The first “readout” in 2012 at CSUN was organized by Elizabeth Blakey, assistant professor of journalism, with students presenting excerpts of censored books in the lobby of the Matador Bookstore complex. 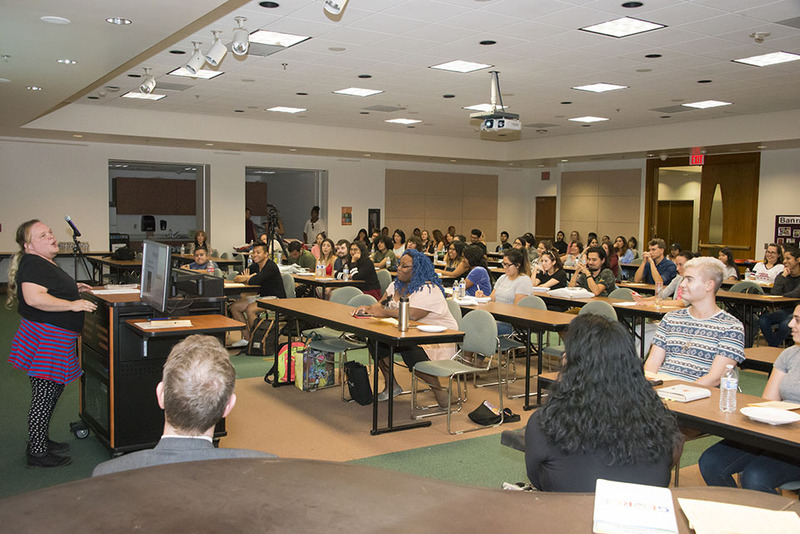 Since then, the readout has grown and is now organized annually by the Delmar T. Oviatt Library faculty and staff, and the Department of Journalism. “We celebrate that we, as residents of this country, have the right to read these books, purchase them and own them,” said Mark Stover, dean of the Delmar T. Oviatt Library. According to library staff, about 90 people attended this year’s event. “The banned books event is an important space for us to exercise our freedom of expression and talk about political, cultural and social issues,” said Blakey, who discussed the impacts of censorship in the digital age. Among the presented books were classics such as The Great Gatsby, written by F. Scott Fitzgerald, and the Harry Potter​ series, written by J. K. Rowling. Each of the nine books presented has been banned for various reasons, such as sexual references or the use of allegedly offensive language. Stover said he believes there should be a better response to controversy in literature, rather than banning books. Gino’s book George was challenged because some people deemed it to be “not appropriate at elementary [school] levels.” The novel tells the story of a young transgender child named George, who looks like a boy but feels like a girl. When George wants to play a female character in her class’ theater production of Charlotte’s Web, her teacher tells her that this is not possible, because she is a boy. Every year, the ALA publishes a list of the country’s most challenged and censored books. Often, books including LGBTQ characters are under attack. “When I looked up the top five banned books of 2016, I was amazed that each one dealt with the theme of LGBTQ in one way or another,” Stover said. It’s crucial to portray these characters, their struggles and feelings in books and other media, said Gino, who prefers “they” as a singular pronoun. “All children can learn from these stories, and especially transgender children need more characters with whom they can identify.